The new spending bill covering the remainder of the fiscal year includes a provision to again allow the Department of Homeland Security to exceed the annual cap on admissions of unskilled non-agricultural workers. This step, if fully implemented by USCIS, potentially would add as many as 63,000 additional H-2B guest workers next year, nearly doubling the size of this program. According to the latest statistics released by USCIS, the H-2B program already has been growing steadily, despite high rates of un- and under-employment for U.S. workers who could do these jobs. The H-2B program allows employers to hire temporary foreign workers to fill low-skill, non-agricultural positions. The law provides for an annual cap of 66,000 visas per year, with a few exceptions. There are three steps to the H-2B process. First, an employer petitions the Department of Labor (DOL) for a foreign labor certification. At this stage, employers apply for foreign laborers, sometimes hundreds or even thousands of them. They are required to show that they have a "temporary need" for these workers, that they will pay the prevailing or other appropriate wage, and that they have made some effort to recruit U.S. workers. There are many definitional loopholes that employers can use to access the program, and most are assisted by labor brokers. In 2017, the Department of Labor approved 81 percent of all petitions for H-2B laborers, similar to the 2016 approval rate of 83 percent. Second, the employer submits an I-129 form to U.S. Citizenship and Immigration Services (USCIS). This form is used for all instances of requesting foreign labor. Finally, prospective alien workers apply for the H-2B visa, usually at a consulate in their home countries. They may remain for the period of stay approved in their labor certification, generally for no more than one year and in one of the two seasons. Some workers are approved for temporary jobs with more than one employer in different seasons, usually with the help of labor brokers, and are not counted twice even though they work in both seasons. H-2B workers are intended to fill positions requiring little to no education or advanced skills. It is helpful to think of these jobs as ones that a typical high school or college student could do during their summer break. In July 2017, the Center for Immigration Studies released an analysis on 2016 H-2B data showing the number of H-2B certified workers by state and by worksite and the locations of employers of large numbers of H-2B workers and high-wage H-2B workers. This report updates that information and notes some trends found in the data. The number of H-2B visa issuances declined slightly from 2016 to 2017. Last year, the State Department issued 83,600 H-2B visas, compared to 84,627 awarded in 2016. Nevertheless, this is still significantly larger than the 69,684 issued in 2015. The annual cap of 66,000 is divided into two seasons. Last year, Congress authorized the secretary of the Department of Homeland Security to make extensions in consultation with the Department of Labor. Former DHS Secretary John Kelly (now chief of staff to the president) did so in September, allowing an additional 15,000 H-2B workers. However, only 13,000 of these additional certifications were actually needed. The number of certified positions increased by 11 percent between FY 2016 and FY 2017. In 2017, DOL certified 133,985 positions, up from 119,232 positions certified in 2016. The figure below shows (from the DOL's Foreign Labor Certification data) the growth of certifications in the past five years alone. Source: DOL Foreign Labor Certification data. Map 1 below shows the extent to which employers are hiring H-2B workers in individual states. The top-10 states for H-2B hiring are (in order): Texas, Florida, Colorado, Louisiana, North Carolina, Virginia, Massachusetts, Pennsylvania, South Carolina, and Arizona. States in the South and the Northeast continue to hold large numbers of H-2B workers, and Texas alone accounts for almost 15 percent of all H-2B certifications. Senators from two of the states listed above — Thom Tillis (R-N.C.) and Tim Kaine (D-Va.) — were instrumental in getting the language authorizing an increase in workers in the 2018 Omnibus package. A number of these states clearly have available workers of the appropriate skill level to do these jobs, as demonstrated by the table below. The second column shows each state's 2017 unemployment rate and the third column shows the percentage of high school dropouts over the age of 25 who are in the labor force, a population that directly competes with H-2B workers for these positions. Map 2 shows the specific city or towns in which the H-2B jobs were authorized. Worksites are concentrated in the Northeast and around large cities. The average wage employers reported grew from $12.31/hour to $13.08/hour between FY 2016 and FY 2017. While many of the H-2B jobs may be menial in nature, the wages are significantly higher than the national minimum wage of $7.25/hour, which indicates that many of the jobs are not "jobs Americans won't do", but more likely jobs that Americans aren't considered for because the employers find it easier to use the H-2B program. Moreover, some research shows that many of the H-2B jobs are in parts of the country where there are workers available, and that do not actually have labor shortages. The presence of H-2B laborers can depress the wages of native workers. I've written previously on how this worked in Guam. Guamanian wages rose significantly when the number of H-2B foreign workers dropped from 437 to 35 between 2016 and 2017. 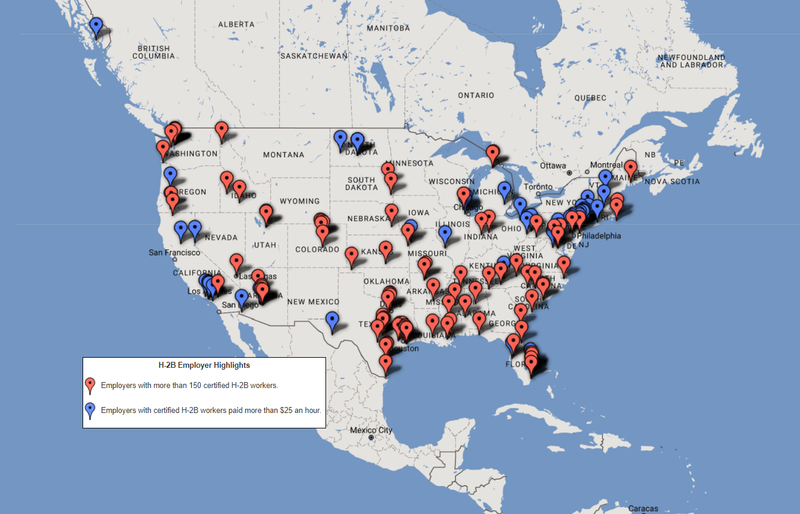 Map 3 shows the corporate locations of employers who were approved for 150 H-2B workers or more and the location of the H-2B jobs paying $25 an hour or more. The employer with the highest number of workers is Brightview Landscapes, headquartered in Pennsylvania, with 2,159 total workers. The employer with the highest wages is the Westmark Group, a marketing agency headquartered in New York, who certified an H-2B worker with a wage of $89.06 per hour. Employers with more than 150 certified H-2B workers. Employers with certified H-2B workers paid more than $25 an hour. The top H-2B occupation category remained the same from 2016 to 2017. While many media accounts focus on H-2B workers in resort jobs, in fact the largest number of workers, by far, are landscapers. The table below shows the top 10 occupational categories in 2017. This data was tabulated from DOL's foreign labor certification data. Business leaders and members of both parties have long sought to expand the H-2B program because it avoids the need for these employers to compete for available U.S. workers. The program adversely affects opportunities for American workers with low education and skill levels. Rather than enlarging this controversial program, lawmakers should instead consider more innovative ways to encourage Americans to enter into the work force. The editorial board of The Gazette in Colorado Springs suggested considering a work requirement for able-bodied adults on Medicaid, who make up 45 percent of Medicaid recipients in that state. Other initiatives could include programs that target churches and charity organizations that interact with under-employed Americans to direct them toward these opportunities. Please visit our H-2B program topic page for more information on this temporary foreign worker program. All data cited in this report, and much more, can be found in our Immigration Data Portal.